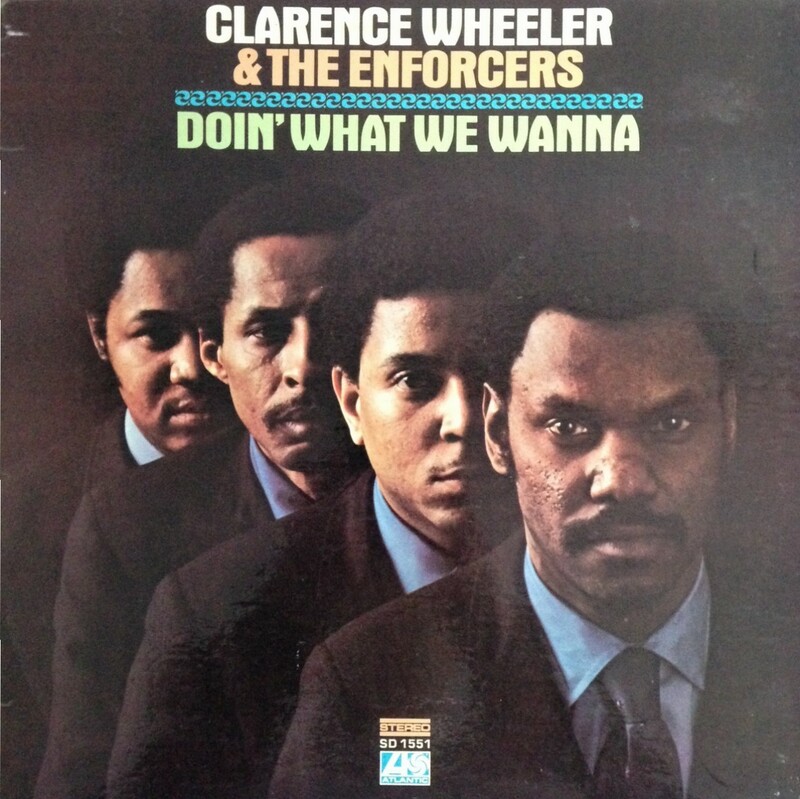 Clarence Wheeler & The Enforcers’s Doin’ What We Wanna is a bonafide funk jazz classic. Clarence Wheeler & The Enforcers was a Chicago-based outfit that consisted of tenor saxophonist Clarence Wheeler, trumpeter Sonny Covington, organist Sonny Burke and drummer George Hughes. Wheeler was formerly associated with organists Jack McDuff and Don Patterson, Covington with organist Eddie Buster, Burke with Odell Brown & The Organizers and Mahalia Jackson, Hughes with Sonny Criss and Sonny Stitt. The story of the group’s heavy-hitting and uplifting debut album from 1970, Doin’ What We Wanna, as collected from DJ Merri Lee’s liner notes (about the only information available on the obscure group), is, paradoxically, rather tragic. Wheeler called in on Dee to ask him to announce the funeral of his young wife on the radio station. On a subsequent visit to the studio, Wheeler discussed his current project, The Enforcers, information that Dee passed to Atlantic’s A&R man, Joel Dorn. Dorn visited a performance by the band and, duly impressed, signed The Enforcers. It wasn’t long before they recorded Doin’ What We Wanna on November 18, 1969. Subsequently, the group recorded two albums for Atlantic, The Love I’ve Been Looking For in 1971 and New Chicago Blues in 1973. Good albums but Doin’ What We Wanna is the one, bingo, touchdown, or in terms of darts, one-hundred-and-eeeiiighttyyyyy! There’s no end to the joyful surprise of discovering their thunderous uptempo version of Eddie Harris’s Sham Time, vigorous take on Brother Jack McDuff’s Theme From Electric Surfboard, bashful groove of Doin’ What I Wanna and joyful funk of Lee Roland’s Right On, which has, helped along by singers Cissy Houston, Judy Clay and Jackie Verdell, a Mardi Gras-ish feel to it. The fusion of New Orleans Funk and the South Side is a fact! Recording engineer Jerry DeClerque perfectly encapsulated the meaty sound that The Enforcers presumably entertained club crowds with in the Midwest. Furthermore, the spicy solo’s of Wheeler, Covington and Burke should be pointed out, funk and modern jazz functioning as indelible parts of the meaty sum. And Wheeler is a clever arranger, allowing himself funky poetic license, adding a groovy interlude and heavy breaks to their soaring interpretation of The Beatles/McCartney’s Hey Jude. The bass pedal sound and playing of organist Sonny Burke is the rabbit in the hat. Relatively simple lines with plenty of resonance and warmth serve as the indispensable undercurrent of the band’s muscular style throughout the album but especially during Hey Jude. The bass even constitutes the concise start of the album, an ear-catching commencement of Clarence Wheeler & The Enforcers’s splendid soul jazz fest.